Bartow, FL- May 22, 2013 – Bartow Ford celebrated 20 years of Drive for Excellence by honoring 20 Polk County Junior and Senior finalists for their educational excellence on May 18, 2013. This year’s winner Sierra Coffman, a Junior at George W. Jenkins High School, waited 2nd in line to try her chances of unlocking the grand prize, a 2014 Ford Mustang V6 Convertible. Much to Ms. Coffman’s dismay, her key did not unlock the Mustang upon the first try. After all of the contestants attempted their luck with the vehicle, Sierra was allowed one more chance. With one swift turn of the key the door opened. “I was really excited because I had already gone through the line, and my key didn’t open the door and now I’m just so happy,” exclaimed the overjoyed Ms. Coffman. The Bartow Ford Drive for Excellence program was established to encourage excellence in education among Polk County Juniors and Seniors. For two decades, it has offered local students, who achieve A’s, B’s and perfect attendance, the chance to be drawn as a top qualifier for the opportunity to win a new Ford vehicle. “We just finished giving away our 20th automobile to a lucky high school student. I was thinking that doing this over the past 20 years, we have given away over a half a million dollars in vehicles. Since this was a special year, we gave away a brand new Mustang V6 Convertible,” responded Benny Robles Sr., President of Bartow Ford Company. Qualifiers and guests of the event were treated to a photo prop booth, games of corn hole, refreshments, and live music and raffles, courtesy of 97 Country/WPCV. “This is a great way for us to reward the Juniors and Seniors who excel academically. We want to recognize their hard work and efforts scholastically, and it’s the least that we can do for the community,” concluded Benny. The Drive for Excellence Event was sponsored by 97 Country/WPCV and Deli Delicacies. Founded in 1948, Bartow Ford Company is a privately held company providing new and used vehicles, and automotive services. The Central Florida facility, located on 30 acres of property in Polk County, with over 200 employees, includes a service and parts department, detail depot, collision center, rental vehicles, commercial services and a quick-lane. Bartow Ford has achieved Ford Motor Company’s prestigious President’s Award 16 times. 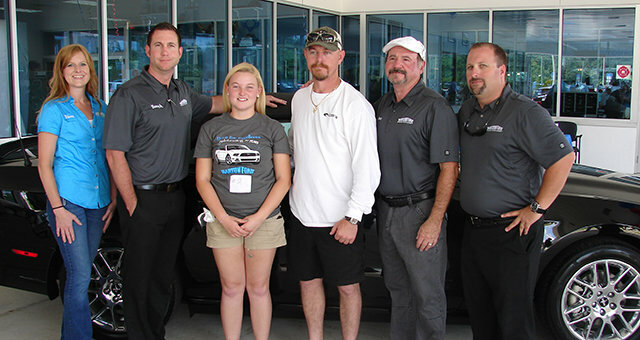 For more info on Bartow Ford Company, please visit www.BartowFord.com. If you would like more information about this topic or to schedule an interview with Benny Robles Sr., please contact Kimberly Vigil at 800-533-0425 ext. 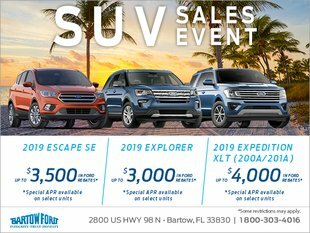 239or email kimberlyv@bartowford.com.